Click here to view current Educational Services for Nurses opportunities. The University of Michigan Health System is among the most respected and prominent academic medical centers in the United States. Our reputation for excellence in quality patient care is due in great part to the talents, skills, dedication and passion of our exceptional nursing staff. We recognize that in order to maintain and build upon this foundation of success, we must continually empower our nurses to gain new knowledge, acquire new skills and develop both personally and professionally. Staffed by professionals who understand the various developmental and educational needs of nurses, the Educational Services for Nurses specialty area within UMHS greatly impacts quality patient care by ensuring our nurses have every opportunity to realize their fullest potential. A comprehensive network of resources and programs, designed to empower the professional development of nursing professionals across UMHS. 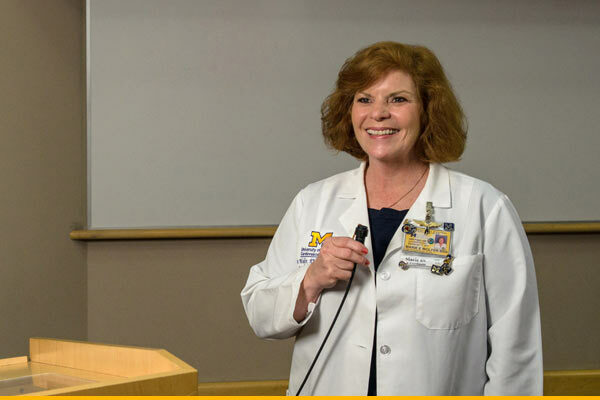 Exists to help create a nursing practice environment at UMHS with no barriers, where nurses flourish and prosper in extraordinary ways in the delivery of outstanding patient care that is innovative, grounded in science, guided by our core values and driven by compassion. Comprehensively, Nurse Recruitment and Retention embraces the principles of abundant education and never-ending growth. The Professional Development Framework model aims to empower nurses to pursue professional development that promotes excellence through these principles. In doing so, the Framework serves the goal of UMHS nursing – to provide world-class patient care. The Framework model encourages nurses to build their careers at UMHS. Within this framework, movement toward personalized professional aspirations occurs at a self-initiated pace. The Professional Development Framework website was designed specifically with our UMHS nurses in mind — to inspire, inform and assist them in their professional journey in our progressive and exciting nursing community. Within each domain, clinical behaviors are further defined and articulated along a continuum of evolving expertise.